Human moments from the ridiculous to the heart-rending lept from the boilerplate at the State of the Union address and the GOP response to it. Marco Rubio's mid-speech lunge for an awkwardly placed bottle of water during his Republican Party response to the State of the Union immediately became the break-out moment of his remarks Tuesday night. Before the clock struck midnight, there was already a #ThirstyRubio hashtag, at least four different fake Twitter feeds (such as @Water4Rubio, "Drinking water awkwardly on national Television since 1969. "), a basic meme ("Stay Thirsty My Friends"), gifs (and more GIFs), a deconstruction, and even, from Deadspin, a slow-motion version of the Rubio reach set to the indie music tune "Danger of the Water," by the Futureheads. 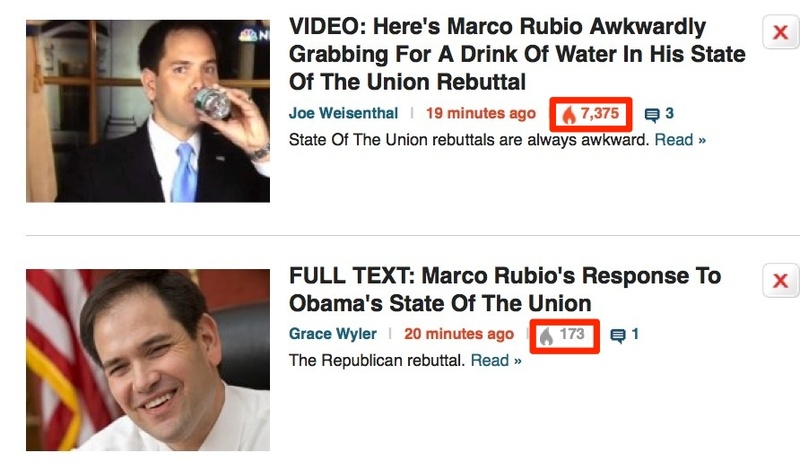 Rubio (or his social media team) responded in kind -- which was pretty much the only thing they could do once Rubio's otherwise perfectly passable performance (unusual for a SOTU response) was eclipsed by the bad advance work that left him with a long speech, a dry mouth, and no TV-ready glass of water within easy reach. Shortly after 10 p.m., "Rubio water" massively outnumbered Twitter mentions of Obama's "they deserve a vote" riff at the end of his speech. It's too bad, because the other most powerful form of human emotion on display Tuesday night also involved questions of the wet and the dry -- in this case, the dry eyes of Cleopatra Cowley-Pendleton and Nathaniel A. Pendleton, parents of slain Chicago 15-year-old Hadiya Pendleton. The couple somehow managed to go on national television as guests in the first lady's viewing box just weeks after losing their daughter, who was murdered on January 29, without completely losing their own composure as the president spoke of their child and used the example of their loss to urge members of Congress to allow gun control legislation to come up for a vote. It may seem a stretch to yoke these two moments together, yet the gun-control passage was the emotional crescendo of Obama's speech for the same reason the Rubio reach became an instant viral sensation. They were deeply human moments plonked amid the formal language and staging of the highly-manufactured evening, reminders that for all the ideology and political calculations -- and Obama's invocation of the Pendletons was nothing if not pointedly seeking a political outcome -- politics is about people. People want politicians who seem real at the same time they are shocked when they act it. And politics is at its most powerful when it addresses not just the sweeping themes of impending and contested legislation, but the individuals who most need to see major changes in the communities in which they live.